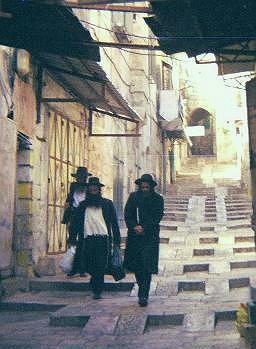 Travel in the Old City of Jerusalem. Part 1 – The Beginning: Where it Starts. Numbers above pictures will refer to numbered positions on this map. When I found I’d be going to Jerusalem for a week I began looking all over the internet to find accounts of other people’s travels to the Old City, which I was particularly interested in getting to know. But while there are lots of little reports of visits, none are very extensive or give much of an indication of what to expect when you get there. I’d bought a couple guides, the best of which turned out to be the Eyewitness Travel Guide to Jerusalem and the Holy Land but I think it would be about now, when I have completed the journey and thought about it and have spent a good bit of time figuring out in retrospect what it was that I saw without comprehending… now I could get a lot of use out of a guidebook. But back then in real time it was a struggle. I’d borrowed my daughter’s digital camera and, when that ran out of memory, I took a couple rolls of film. This amounted to over 200 pictures. When I got back I thought it might be a good plan to write up my own well illustrated account of a week in the Old City. Here goes…. My week in the old city began with a call from the BBC asking if I’d be willing to fly to Jerusalem Wednesday for an on-camera interview about “Jesus the Healer” Thursday at a Judean desert location and a return to Pennsylvania Friday. I’ve written a book on that subject and have been on the TV a few times already, so I’m in the rolodex. Well, I mulled the offer over because I hadn’t ever been to Jerusalem, but it seemed like an awful lot of unpleasant flight time and not much time on the ground. So I asked if a longer visit could be arranged and they agreed to put me up for six nights, although I forfeited something or other I was never quite clear about, I think it was a per diem stipend. Also I’d pay for my own meals except for the evening before and the day of the interview itself; on the other hand incidental expenses would be covered by the honorarium. I think it turned out that I broke even on the whole deal. So, I fly into Tel Aviv on British Air (what else would BBC be paying for?) 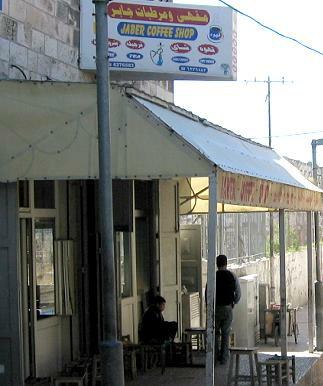 and am happy to find a taxi man waiting with my name on a nice sign and off we drive to Jerusalem in the afternoon. I get situated in the American Colony Hotel, a place of great fame and luxury. My name was added to the guestbook right under Christiana Amanpour’s name. My room was perfectly acceptable with a huge marble bathroom and a not so big living space. BBC was not about to put me up in the most expensive suite… but I can’t complain. 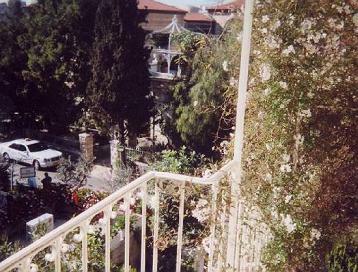 This is a view of the American Colony Hotel entry from the balcony (actually fire-escape) adjacent to my room. While it looks summery, the morning temperatures were in the thirties and I, having nothing but a huge Pennsylvania winter overcoat that was far too heavy for the afternoons, ended up wearing triple shirts for warmth, and even that was none too warm in the mornings. I don’t suppose there’s a painting of Jesus risen into a snowstorm, but it’s not climatologically impossible for there to be snow on Easter in Jerusalem. I arrived Sunday evening. My BBC interview would take place on Thursday out in the Judean wilderness near the Dead Sea (a site they chose because they wanted a connection made with Jesus’ being driven into the wilderness by the Spirit after his baptism). The rest of the time was my own. That very evening I thought why not just go to the Old City, see if it can be done without fatal consequences. I asked at the hotel front desk what the odds were of surviving a walk through East Jerusalem to the Old City and the guy tells me well, we can’t guarantee anything, but it’s perfectly safe and so off I go, following the simple easy instructions to turn left and keep going. One soon comes to a major fork in the road and what to do? I go left. 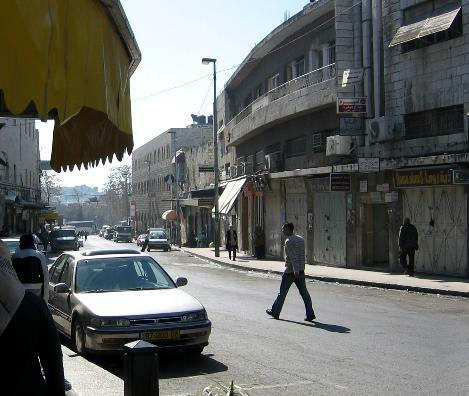 That turns out to make a difference, as the left road “Salah ed Din Street = Saladin Street” goes through a non-touristy urban environment to the Herod Gate and the right hand Nablus Road takes you through a more Americanized region, past an American consulate, down to the Damascus Gate. The walk from the hotel to the Herod Gate is about 15 minutes and could be less for those who don’t stop and look at things. 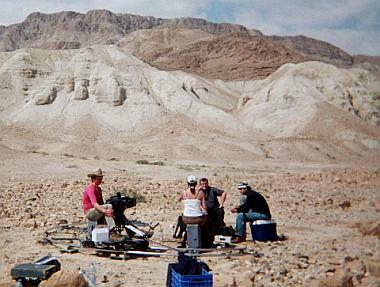 It goes by an Israeli court building and a center for biblical archaeological study, neither of which invited tourists. The East Jerusalem environment did not seem threatening at all to me. The local folks are used to tourists, although I don’t think I ever saw another on Saladin Street. The street is lined with small shops ranging from electronic device emporia to local restaurants to candy stores, lots of candy stores, music CD shops with blaring music to annoy potential customers, and so down to the Gate itself. 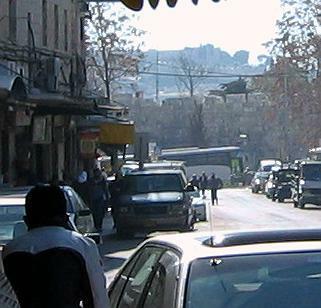 As one approaches the gates of the Old City of Jerusalem the culture-shock effect of seeing modern urban stores and vehicles against a medieval background increases. The picture below depicts the visually ugly but historically euphonious meeting of Saladin Street with Sultan Suleiman Street. 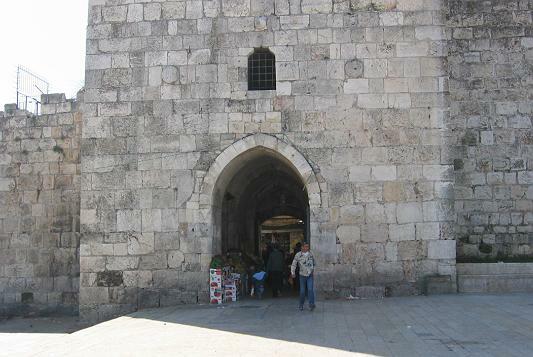 The Herod Gate itself was constructed in 1875; it’s also known as the Flower Gate because of the small ornamental flower to the right of the window above the gate. 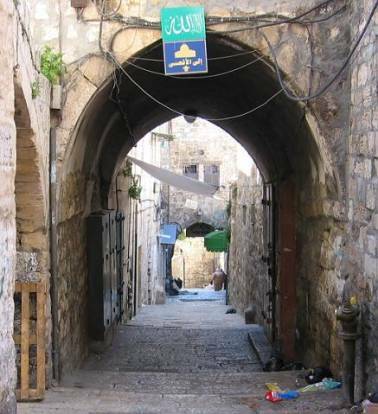 It is the principal gateway into the residential Arab section of the Old City and is largely devoid of touristy elements. 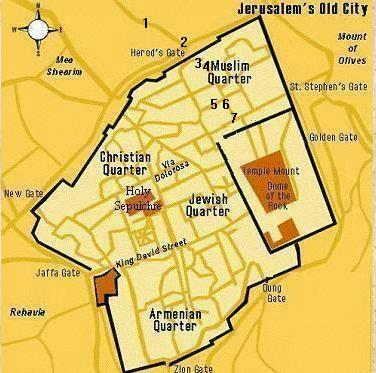 In that it contrasts strongly with the Jaffa Gate, the Damascus Gate, and the Dung Gate through which most non-residents enter. I became more fond of the Herod Gate as I saw more of those other three, because with the Herod Gate you get an entrance into a living old medieval type city; with the others its either modern militarism at the Dung Gate, tourism at the Jaffa Gate, or crowded mercantilism at the Damascus Gate. Inside the Herod Gate several vendors shelter from the weather. The Old City shops in this area of the Arab quarter and along Saladin Street and here and there throughout all of Old Jerusalem serve the local population. Fruits and vegetables and spices are for sale everywhere by individual local entrepreneurs. 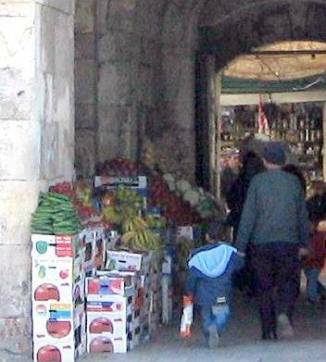 These vendors work inside the Herod Gate itself. Just beyond you can see the open front of an enclosed shop. I went in on my first evening, turned right, saw a few local stores and some folks who seemed a bit surprised to see me and went back to the hotel to bed. The next day, Monday, up and out again, back along the same route through the Herod Gate this time with the whole day in front of me and a rather vague ambition of going through all, or most, of the seven gates of the City (Hallelulia). Well, actually, I’m thinking of the Judy Collins song with “twelve gates to the city, hallelulia” and I guess that’s somewhere else: the heavenly Jerusalem presumably. Anyhow, I decided to just keep photographing along as I went, in other words to take a photo of whatever was ahead of me and then, when I got to a place that seemed to be about at the end of the vista of the previous photo, to take another one. This has the advantage and disadvantage of being a random process that precludes my taking artsy pictures that promise to be really excellent but turn out to be dull. So here I go, turning left out of the Herod’s Gate to see a street lined to the right with small shops serving the local population. 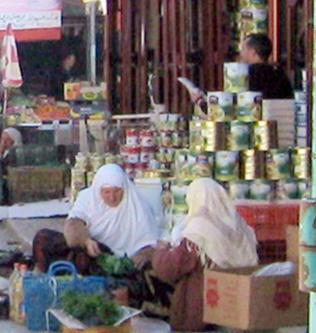 Women of mature years, both here and on Saladin Street, sit with bundles of herbs, always including mint. 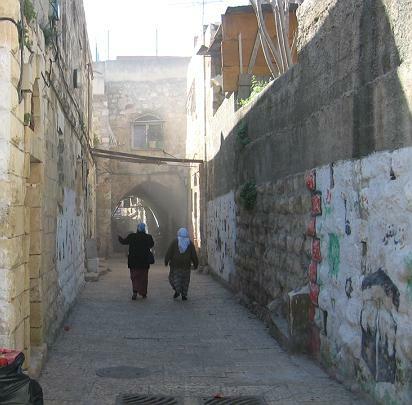 One needs reminding that the Old City is an actual place of residence and life for thousands of people. It’s not a museum. I rather wish I’d stopped in this local coffee shop, but I’d just gotten started on my walk and also, as yet, hadn’t developed the “what the hell do I care” attitude toward being looked at by the locals as an alien. There were no signs of hostility, but puzzlement. I didn’t know that the Herod Gate receives relatively few tourists. What did I know… a Gate’s a Gate. At first I was surprised at the amount of trash lying in corners here and there, but I eventually decided that this is because I happened to be walking through on the morning of trash pickup day and the bags of garbage would soon be removed. Turning right on El Qadisieh Road I seem to have stepped into a foggy morning. It turns out that this is dust from men fixing a roof on the left side of the road. The painted mural on the right side of the street is interesting but I have no clue what it represents. This tall lady - shorter lady combo reappears in a later photo. Further down El Qadisieh Road a lady shopping checks out a food shop. On the right the open door exposes a downstairs room where a baker is preparing the ubiquitous sesame seeded oblong Palestinian rolls. Some of the baker’s products are in cellophane on the left side of the street.. 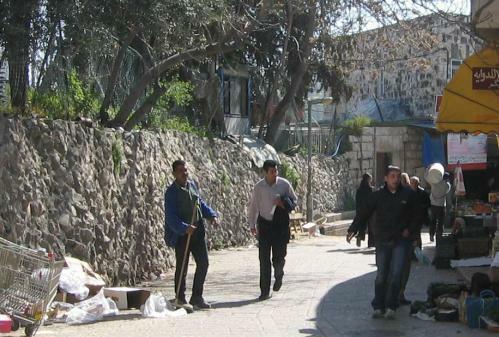 I began to realize, making my way along El Qadisieh Road toward the “Temple Mount” that the streets to the mount run uninterruptedly downhill. I had always figured that the term “mount” implied something uphill and that the great Temple Mount of Jerusalem would be on the highest natural hill in the area. Not so. 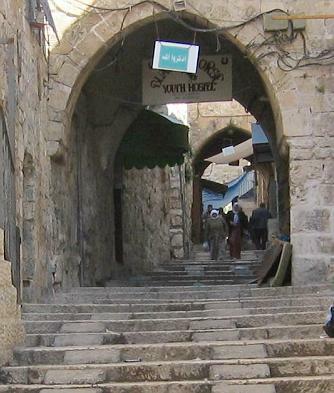 To get there from the Jaffa, New, Damascus, Zion, or Herod Gates you walk down. Well, when you finally get to the vicinity there’s a stroll up a little ways, but there’s no “mount” involved. The following photograph shows a side street going right off El Qadisieh Road, Shadad Street. The hirsute folks walking down the street may or may not live nearby. 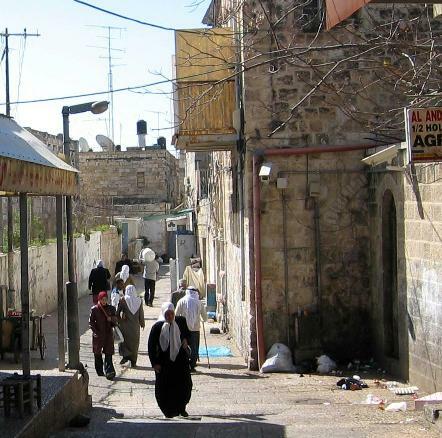 While in some sense this is an Arab Moslem district reserved for Arab Moslems homes are sometimes sold to Jewish settlers who look forward to living in an entirely Jewish Jerusalem. It’s clear in an area like this that there is a Jerusalemite culture in existence wholly apart from the tourist culture and the Judaica culture that dominate much of the rest of the city. These are real people, not Americans visiting, not Americans pretending to be Jerusalemites. 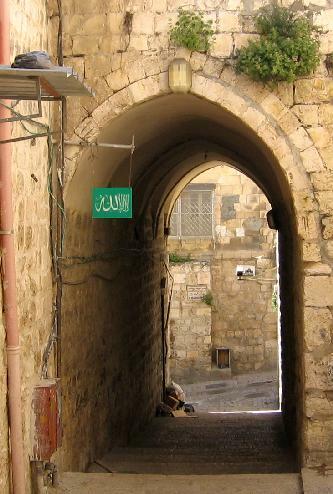 The sign below, in Arabic, shows that this is a path to the Mosque al Aqsa. At the end of this picture’s vista you can see a slight jog to the left beyond the green awning. Above the awning, as is very typical and common, a home stretches across the street above an arch. One wonders walking by what life there would be like. 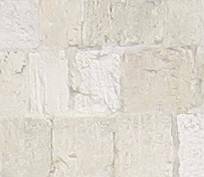 This is the junction of Al Qadisieh Street and Shaar ha-Arayot Street notable in this picture for its display of the characteristic golden glow of Jerusalem limestone. 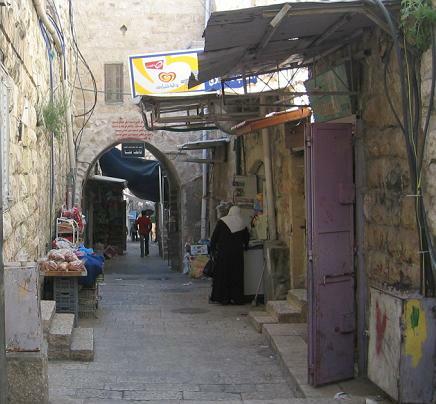 The Shaar ha-Arayot Street becomes the Via Dolorosa. Part XIII. Jaffa Gate and a concluding walk.